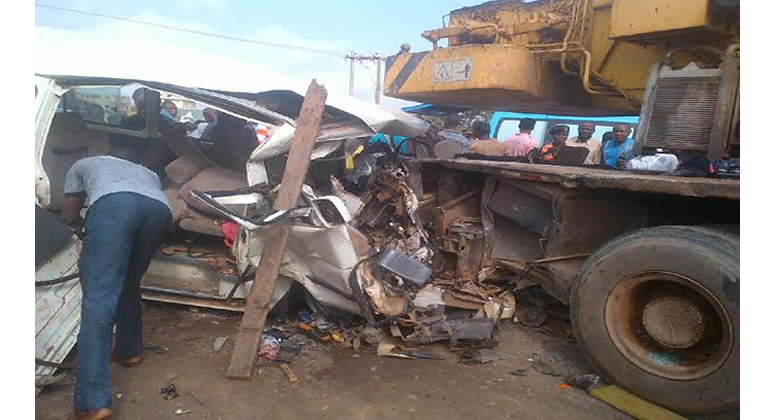 It was a sad day yesterday as a pregnant woman, two children and seven others perished in an auto crash involving an 18-seater bus and an articulated crane lorry belonging to a Chinese construction firm in Abakaliki, Ebonyi State capital. The incident occurred at about 8.45a.m at Ogbe-Awusa junction along the ever-busy Onueke-Afikpo Federal Highway when the bus, belonging to the Ezza South Mass Transit with registration number, NKE, 28LG rammed into the crane lorry which was making a U- turn on the road. The ill fated bus was said to have loaded from Onueke, Ezza South council headquarters coming to Abakaliki when the incident occurred. Men of the Federal Road Safety Corps (FRSC), Ebonyi Sector Command were at the scene to save some of the victims, although it was gathered that the bus driver died on the spot. An eyewitness, Mr. Favour John, who spoke to our correspondent at the scene, said “accidents usually happen all the time at this Ogbe-Awusa junction. The truck was trying to turn all the way from Spera in Deo junction but the bus driver was on a very high speed and could not exercise patience, just like other commuters who parked and waited for the lorry to complete its turning but, because the driver was on speed, he rammed into the crane resulting in this number of casualties.” Another eyewitness, Chibuike Nwali also lamented that it was painful that many passengers died in an accident many believed was avoidable. However, an FRSC official, who did not want his name in print revealed that his men on duty have impounded the same bus because of dangerous and reckless driving of the deceased driver just last week before yesterday’s incident and lamented that despite the efforts of the commission, commuters still indulged in reckless driving which poses great danger to other road users. Meanwhile, when contacted, Caretaker Committee Chairman of Ezza South Council Area, Mr. Joseph Egede confirmed the incident and said the survivors had been taken to the Federal Teaching Hospital (FETHA), Abakaliki, for treatment while the dead have been deposited at the mortuary. What happened to this careless and murderous driver? can someone tell me. May God give their families the fortitude to bear this irreparable lose. May God rest their souls in Jesus Name. Amen! May God give their various families the fortitude to bear this irreparable lose. May God rest their souls in Jesus Name. Amen!